I'm excited to announce that I'll be presenting a seminar and a worship set in less than a month at Lifest 2015 in Oshkosh! On Saturday, July 11th, you can find me with a great group of friends on a couple of stages at this amazing Christian music festival. The band is set to plunge into the heart of God with worshipers that Saturday morning. Stay tuned for more info on the worship set. We'll be going after the passion of David's Psalm 42 along with amazing quotes from A.W. Tozer's The Pursuit of God. Then I'll be presenting from my Road Trip book that afternoon. My talk is on: God’s Not Dead: Preparing for the Faith Challenge at College. This is a powerful talk that goes to the heart of embracing deep faith through the distractions and direct confrontations of the college years. We're also working out the details of a worship set and speaking at a Fond du Lac church on that Sunday morning, July 12th. By the way...we're in Tomahawk! Yes, our move is accomplished and I'm jotting this blog post from my new home office in Tomahawk, WI. We're so blessed to be here and so excited to be connecting more closely with our home church, the Northwoods Vineyard Church. Colleen is enjoying setting up her new nest. I'm looking forward to being on worship team again next week. Wade is all set up in his cabin in the back yard. And Jason has three weeks under his belt at Tomahawk Middle School, with a summer of sports camps well underway. Slowly we're reengaging with life after a grueling winter of projects to get us here. God is good! Well, that's my story. 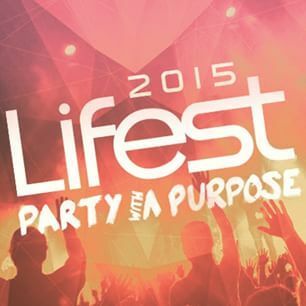 Check out the Lifest 2015 website for an unbelievable half-week of jammin' with the fam! I'd love to hear your stories of Lifests past, or other Christian festivals you've attended. What made it special for you?